We’re completing the 50+ Tools and Techniques today with this final installment. Read about advanced selection and masking tools, as well as some stupid graphics geek tricks, and ways to fake removing a background in seconds. Whether you’re skilled at Photoshop or a beginner, you’ll be sure to find something to add to your bag of tricks here. Besides descriptions of some of the less-than obvious PS tools, we dispel some common questions about Fill vs Opacity, and Blending Modes like Multiply and Screen. Keep reading! Have you read the first two parts of the 50+ Tools and Techniques? If not, they’re still available, and they provide a good overview of the basics you’ll need to use these more advanced tools and tips for removing backgrounds. If you’ve caught up with these but still need some brushing up, you can check out a HTG Guide to Layer Masks and Vector Masks, which will come in handy with these tips on advanced maskmaking. 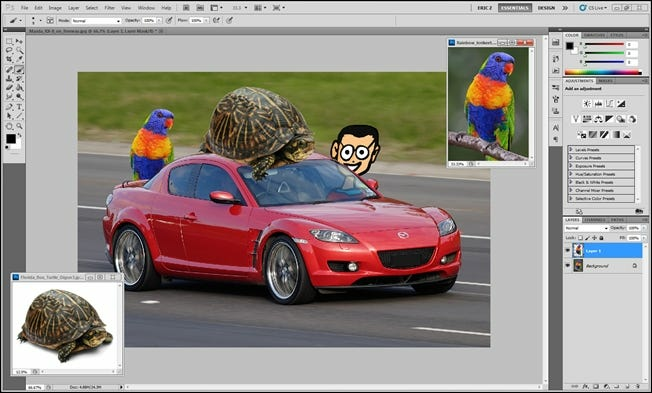 Finally, if you feel confident in your Photoshop knowledge, dive on in! 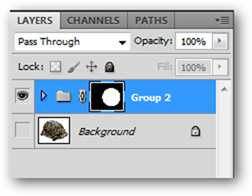 The Masks Panel is a sort of nexus in Photoshop for creating and refining your existing Layer Masks. 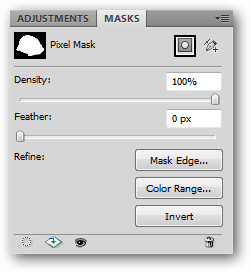 If you don’t have the Masks Panel visible in Photoshop, you can always grab it by going to Window > Masks. Density increases or reduces the transparency of the mask, allowing more or less of your masked areas to appear or disappear. 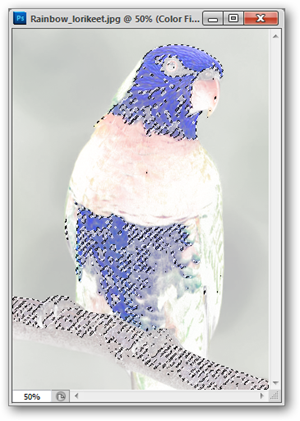 Feather (shown above) softens the edges of your mask automatically. When done through the mask panel, this feathering is dynamic, and always reversible. 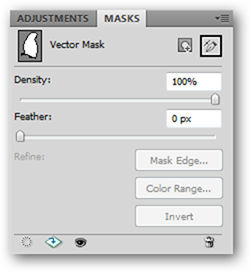 The Masks Panel also works with Vector Masks, but unfortunately, it only allows for adjustment of the density and feathering options. Combined with a rough selection (for instance, the Magic Wand or Quick Selection tools), Refine Selection gives you options to automatically refine that existing mask. You can find it under Select > Refine Mask when you’re working with a Mask, or you can simply use the “Refine” button on the Masks Panel. The “Smart Radius” is where all the action is here. 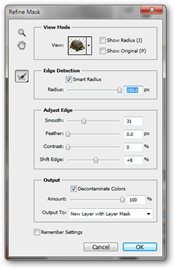 You can adjust your mask with Photoshop’s built in edge detect, which can very carefully mask difficult image data, like hair. FYI, readers, when you’re working with a selection and not a mask, the menu item become “Refine Edge,” and not “Refine Mask.” Both tools are functionally identical and used in slightly different situations. 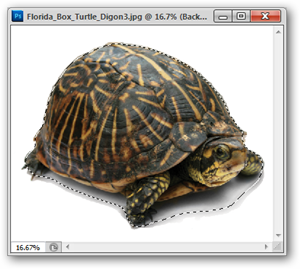 Layer Masks are not limited to single layers. 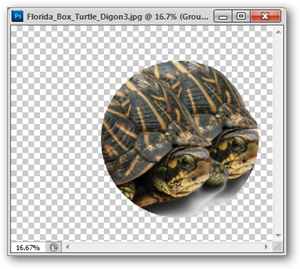 Photoshop has the ability to clump multiple layers into a single “folder” of layers called a Layer Group. 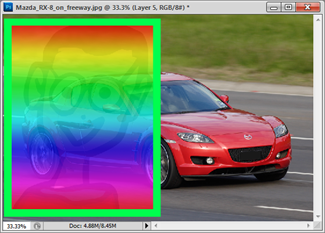 Select multiple layers by Shift + clicking with your mouse, and press Ctrl + G to group them. 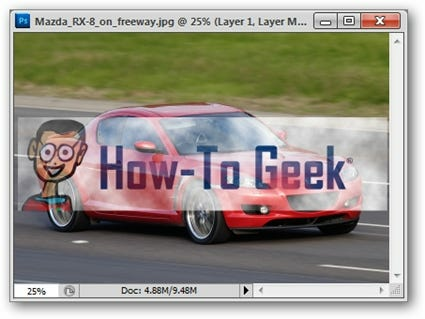 You can apply a mask directly to the group of layers as usual, with the Group Mask hiding the image information not already masked away in the layers inside the group. By using your eyedropper tool (shortcut key: I) choose a color from your image, then navigate to Select > Color Range. 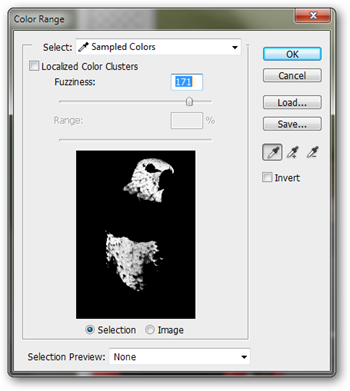 The color range tool will load a selection of that color, which you can control with the slider tool, shown above right. 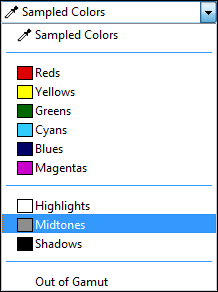 You may find that Photoshop thinks that the color you’re using is similar to colors you don’t see as all that similar, but Color Range is quite handy for loading selections and creating masks, nonetheless. Select Range also has the option of grabbing the primary colors in your image, or the highlights, midtones, and shadows, if you’re interested in that sort of thing. 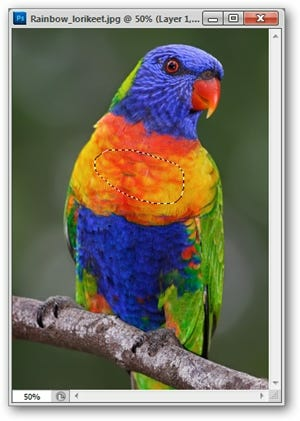 Handy if you want to mask off or adjust certain parts of your image. Unlike most of the other tools in this series of How-tos, Select > Grow is not recommended by the author under any plausible real world scenario, as it is somewhat unpredictable and gives results that aren’t useful. Consider the “tip” here to ignore this tool, should you come across it. There are many other tools that accomplish the same things in more useful and controlled ways. Load Selection is one of the great indispensible tools of Photoshop. 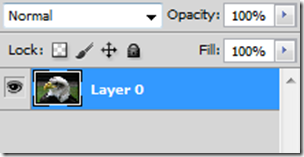 You can hold Ctrl and then click any layer (or channel) to load the non-transparent pixels, or you can navigate to Select > Load Selection to get a handy dialog box with lots of helpful options. As we’ve already covered drawing paths, all vector shapes can be loaded as selections to be cut, copied, pasted, and used as masks, as well as being made directly into Vector Masks. One of the most “Graphics Geek” ways possible to load a selection. It is actually possible to use the channel data that makes up your image to load a selection. Not sure how image channels work? 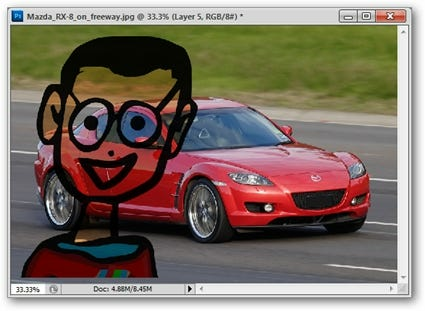 How-To Geek has already wrote about what image channels mean, and also an elegant way to use image channels to remove backgrounds. Opacity refers to how non-transparent (see-through) any particular layer is. 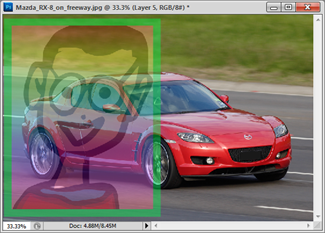 By reducing the Opacity, layers located below it in the panel will show through in a semi-visible manner. 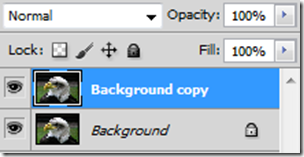 You may notice a second “Opacity” slider below, called “Fill” and wondered what the difference was. Here’s the answer. Fill affects the alpha channel of the opaque pixels in a layer—if you’re using layer effects on said layer, they are not affected. For a clearer demonstration of this, look at the example on the right, with the layer effects (Stroke and Gradient Overlay) blending into the background as the “Opacity” is set to 50%. The example on the right reduces the appearance of the geek logo without reducing the appearance of the gradient and stroke. 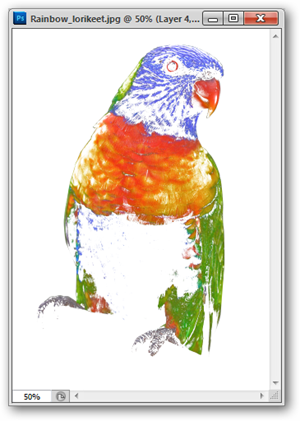 Have you ever printed on an inkjet transparency? This is sort of how the “Multiply” blending mode works. All white is reduced to clear, transparent white, with colors become more opaque, the darker they appear. An old geek trick is to use this method and combine it with a white underpainting done with the brush tool in a separate layer. You’d be surprised how easy this is to do, and how quick you can get good results! Screen can be thought of as the opposite of Multiply. The lighter the color of a layer, the more opaque it appears. The darkest colors appear transparent in this mode. 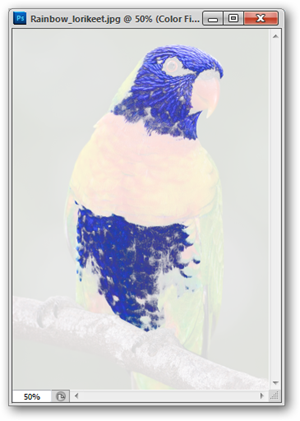 Creates a cool looking blending transparency out of any masked layer. Simply create a mask and use the Gradient Tool (Shortcut Key: G) with black blending to white. 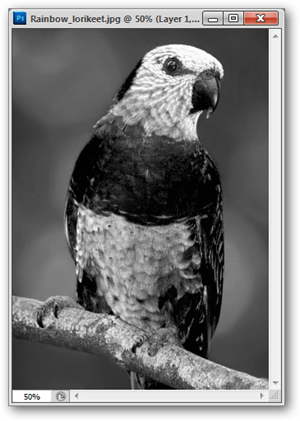 Another non-obvious use of layer masks, many filters can be used to mask out areas of a layer. 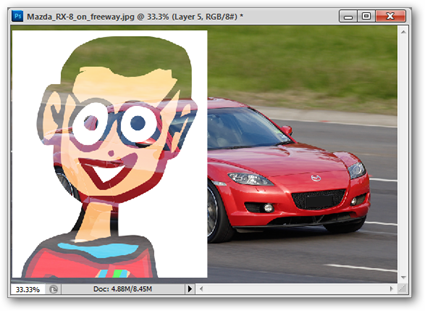 In the illustrated example, we’ve used Filters > Render > Clouds. Image Credits: Florida Box Turtle by Jonathan Zander, available under Creative Commons. Rainbow Lorikeet and Mazda RX-8 by Fir002, available under GNU License.